As part of a (kinda random!) cross-promotional stunt, 5th Cell's upcoming Hybrid will allow for unlockable helmets that let you dress your character up as a Minecraft creeper, among other things. 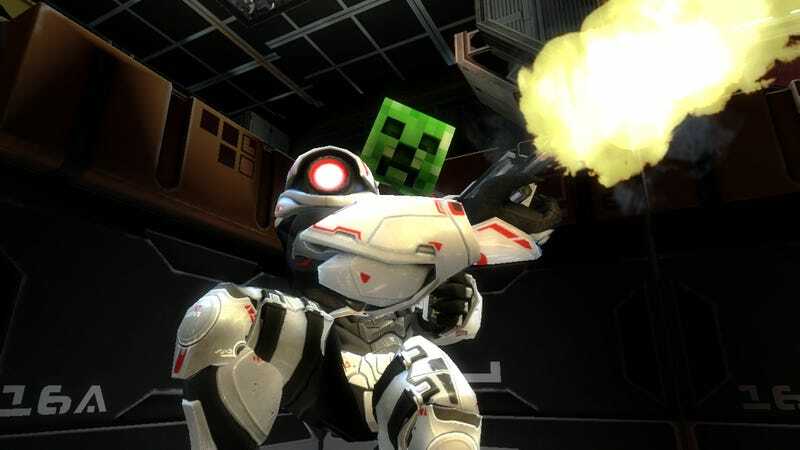 Players who choose the "Variant" side of Hybrid's ongoing world war will have access to the Creeper, while Palladin players will get Steve, the "main character" of Minecraft. Guess I know which class I'm playing in Hybrid. There will be a big Hybrid tournament in which the winners will get a "Helm 'o Glory" while losers will get a "Bag o' Shame" helmet. On the flipside, Minecraft will get two Hybrid skins for players to use. Not sure how many people will use that, but okay. You can check out a bunch of shots of the various helmets and skins in the gallery above.